Fes or Fez is the second largest city of Morocco. There were about 1 million people in 2010. 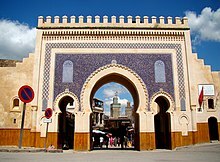 It is the capital of the Fès-Boulemane region. The city has been called the "Mecca of the West" and the "Athens of Africa". Bab Bou Jeloud, "The Blue Gate" of Fez. Fez is the former capital. It is one of the country's four "imperial cities". The others are Rabat, Marrakech and Meknes. "Fas el Bali", one part of the city, is a UNESCO World Heritage Site. Fes has a football team, MAS Fez. They play in the Botola the highest tier of the Moroccan football system. They play their home matches at the 45,000 seat Complexe Sportif de Fès stadium. Muhammad XII of Granada, last Moorish king of Al-Andalus. Jamal Fakir, French international rugby league player. Madame Guinaudeau, French cookery and travel writer. ↑ "Sister cities of İzmir (1/7)" (in Turkish). Retrieved 2008-11-01.